Imagine a world in which you rarely bathed, where running water was rare and drawing a bath downright inconvenient. You may not be surprised to learn that this world existed in France. In the 18th century, the men and women of France needed a way to bathe just the most imperative portions of their bodies on a regular basis. Rather than go through all the trouble of a lukewarm or cold tub of water, or venture into the Seine with a bar of soap, a method of quick cleaning for the nether regions was invented to keep folks feeling fresh. While early bidets were nothing more than porcelain bowls of water conveniently fitted to chairs, the introduction of hand pumps soon led to cleansing jets of water and greater versatility. As plumbing advanced, chamber pots were replaced by our more modern toilets and found a home in the modern bathroom. Bidets soon followed. The word itself is French, but doesn't stand for "uncomfortable posture" or any of the terms one might imagine. 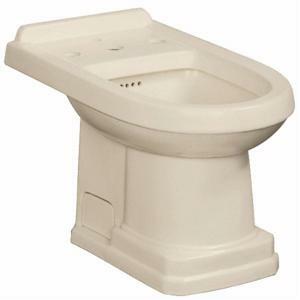 According to the Merriam-Webster online dictionary, "bidet" is actually from the French word for a small horse, and if you've seen an old bidet demonstration or used one yourself, you'll understand why. Though modern models are shaped much more like toilets, the original bidets, being simple bowls, required a lot of squatting and straddling, not unlike you'd do with a horse. So why has the bidet never caught on en masse in the States? Hygiene follows cultural lines, and the width of the Atlantic caused American and European thoughts on this matter to diverge slightly over the course of the 20th century. While Europeans take the extra care to clean their nether regions in a bidet as part of their regular bathroom activity, Americans have grown accustomed to the regularity of a daily shower. Bidets exist, but almost exclusively in the home, and not with the ubiquity of most bathroom fixtures. While the bidet will never replace toilet paper as a self-cleaner, it can make a useful companion. You won't find many Americans willing to give up their TP in exchange, but using both water and paper to clean yourself makes common sense. As the popularity of the bidet grows and globalization brings world cultures together, perhaps the bathroom barriers will break down. It may be only a matter of time before the bidet becomes a happy inhabitant of your average public restroom.